I thought it would be interesting to see how the Dynamic Range (Album DR) has developed over the years, and if this shows a clear picture about the development of the Loudness War. In order to check this, I made a dump of the DR database. I choose to focus on the period 1985-2012. The figure above shows the mean DR-value per year (the error bars represent the standard error). It is clear that, overall, the Dynamic Range of albums has decreased in this period from approximately 13 dB to the 8-9 dB range. It is also interesting to see that the minimum mean value is reached in 2008, the year that Death Magnetic was released. In 2009, we see an increase of +/- 0.5 dB (a double-sided t-test shows that this difference is statistically significant at the 0.01 level). Maybe this has to do with the awareness created by this album with respect to the Loudness War? Furthermore, it seems that the Dynamic Range does not further decrease over the last four years. Has the Loudness War come to an end? 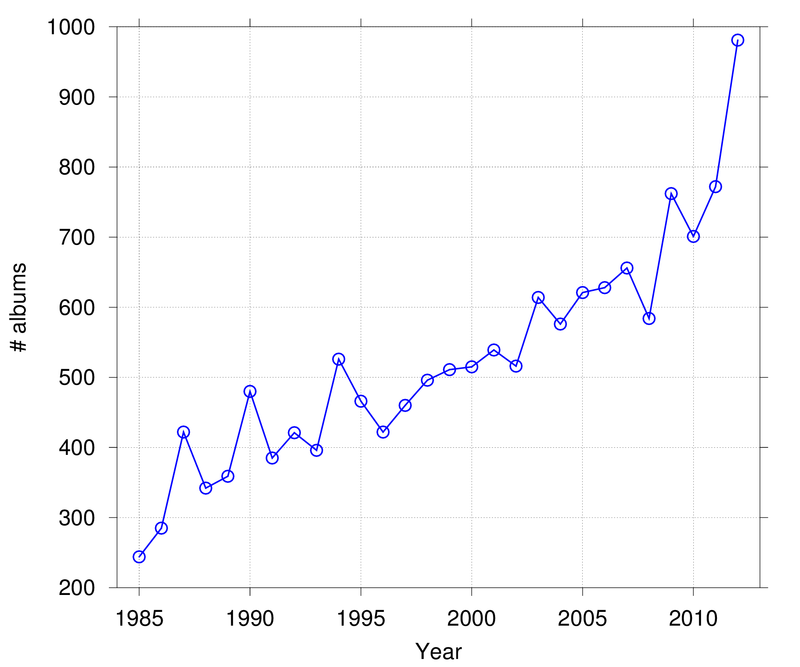 Finally, the figure below shows the number of albums per year that were analyzed. In total, 14,680 albums were included in the analysis. More like it reached a limit. Personally, a Dynamic Range of 6 seems the minimum I can bear, but for less there are few music genres that can still work (such like merzbow...). There must be a confusion between the release date of an album, and the cd release of that album. I guess these dates are mixed. Also , there are different cd release of same album, with different dynamic ranges. 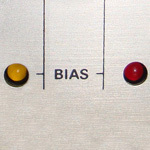 The increasing sample size of albums analyzed in later years would explain the narrower error bars. Nice work compiling this data. Just for entertainment purposes - can you tell us which albums have the highest and lowest DR in the database and what value are those DRs? The war is over: we lost, heavy compression won, at least with most pop music. This might be the sad truth, although I have the feeling awareness is still increasing. Lowest and highest. The lowest DR is an electronic music album, the highest a spoken word one. DR database sadly misses info about producer, mastering engineer and label. I guess you could easily see a pattern, then. If you apply a phase of a few years, the decline in sales very much fits to the decrease in DR. The phase can be explained by the delay with which people realize that their CDs sounded worse and worse, until they stopped buying. This is hardly scientific, yet, but I think nobody has looked into correlations between dwindling sales and the DR/fidelity decrease due to the loudness war? Everyone always sprouts the conjecture that digital sales/piracy is to blame, but who can really tell? Maybe people got fed up paying and listening to tiresome recordings, and found other, cheaper, sources to obtain them. At least the knee in the graph which says "Napster begins" could also say "Loudness War in full effect". There are plnty of other possible reasons for the decrease in sales, and IMHO the primary reason is the increase in entertainment vehicles chasing the domestic buyer's dollar. A person's disposable income is simply shared out amongst a greater number of options. That knee in the graph could just as easily say "video games consoles take off", "PC sales escalate", or "home video becomes widespread". To resolve the sales they probably are thinking: "Maybe because it isn't loud enough? Make it louder..."
I agree. I don't think there's a correlation between decreased dynamic range and decreased sales here. Btw, I edited the graphs so that they now represent the 1985-2012 period (I agree with Fandango that this makes more sense). However, some things in the text need to be changed now as well, maybe a moderator can do this for me? I choose to focus on the period 1970-2012, since the database does not include many albums from before that period (in fact, not all albums in the database have a year associated to them). The figure above shows the mean DR-value per year (the error bars represent the standard error). It is clear that, overall, the Dynamic Range of albums has decreased in this period from approximately 12-14 dB to the 8-9 dB range. I choose to focus on the period 1985-2012. 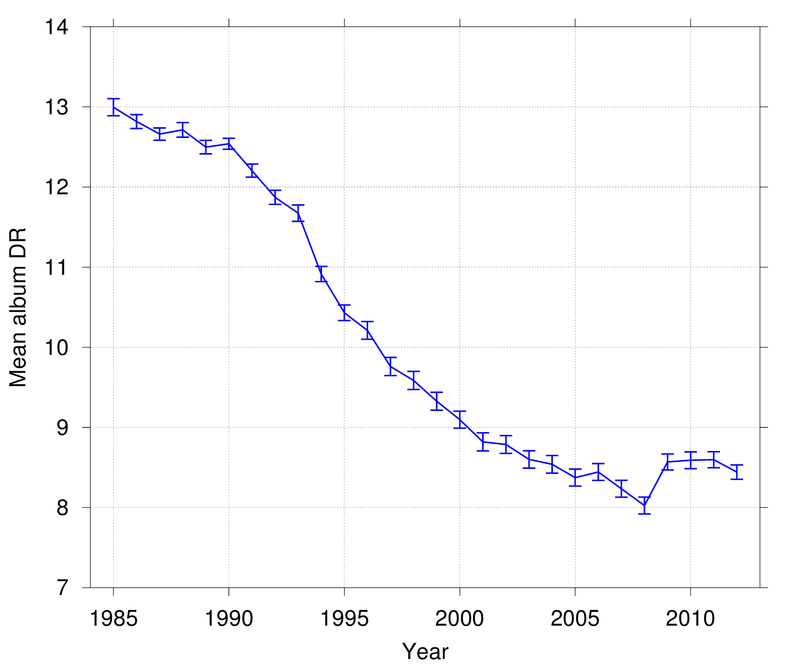 The figure above shows the mean DR-value per year (the error bars represent the standard error). It is clear that, overall, the Dynamic Range of albums has decreased in this period from approximately 13 dB to the 8-9 dB range. In total, 15,652 albums were included in the analysis. In total, 14,680 albums were included in the analysis. I have to sadly agree: We lost - at least with 'energetic' music. Ten yrs ago I wished to go back to 80s-90s mix but now thing have deteriorated even more that i wish we could go back to 2002 or so. Sure we are stuck at -10 db forever but the mix has become more obnoxious to my ears - many releases sound now have the 'death magnetic' harshness. Also no one is doing nothing about volume normalization. I realize its a tough one commercially but many albums are released in P2p. They are never replaygained and I believe Apple has soundcheck 'off' . Seems no one knows what to do or lack initiative / standards. There is still an element of fear to tamper with the original sound level. "Predicted sales based on history?" Really? I can draw any red-dotted line at any point and claim it was an extrapolation from that graph. How dishonest can one get? Any idea how they are counted? Done. Thanks for the interesting thread! I believe that most of the dates in the database represent the actual release date of the CD. Other than that, I think there is no way to separate re-issues/re-masters from the orginals using the data available. "Predicted sales based on history?" Really? I can draw any red-dotted line at any point and claim it was an extrapolation from that graph. How dishonest can one get? Regarding how crippled some of the remasters are, they should maybe be equipped with a big sticker saying "this is not the original recording though it sounds remotely similar". Also no one is doing nothing about volume normalization. The field has never been more active! EBU PLOUD, R128, CALM act, etc. I realize its a tough one commercially but many albums are released in P2p. They are never replaygained and I believe Apple has soundcheck 'off' . Seems no one knows what to do or lack initiative / standards. There is still an element of fear to tamper with the original sound level. Ignorance too. However, the PLOUD group are gently pushing Apple to enable Soundcheck by default, and to move to album-based rather than track-based calculation. It'll be interesting to see if they succeed on either account this year. I would honestly settle for the solid DR 9 average of 1995 for louder and more aggressive forms of music. Whenever I have a discussion with people about the so-called Loudness War I'm, more often than not, seemingly dismissed as an "audio snob." This is just an opinion and I hate to sound like the old fart chasing kids off my yard but: it seems to me that most of the people that scoff and are dismissive of legitimate complaints are younger people who didn't grow up with music sounding any better than Death Magnetic. ...but then again there's my brother who, at 41, is a few years older than me and doesn't seem to care or notice...unless we talk about later Slayer albums. In reference to David's comment about PLOUD gently prodding Apple that would be great. Regardless of how some feel about Apple, it would really help if it started there. I believe that they can have the most influence on the rest of the industry that deals in sales of music. the problem i have with this data is the following. the submissions to dr.loudness-war.info are probably biased due to self-selection. i expect that the site is frequented primarily by very tech-savvy users (i.e., "geeks" or "nerds"). there is no reason to believe that group's musical taste to be identical to the entire population. it's also conceivable that users elect to submit albums not randomly, but are more likely to submit releases that stand out in one way or another. not saying the stats are entirely meaningless, but they should be taken with a grain of salt, just as you should take studies in experimental psychology in which all subjects were undergrads in psychology with a grain of salt. Although I had this concern as well, I don't think it is that much of a problem. Note that almost 15,000 albums were included, I have sufficient reason to believe that there is enough 'spread' in genre, dynamic range, etc. And that is exactly my point, they always use the piracy argument as a strawman, without even considering other possibilities. Heh. 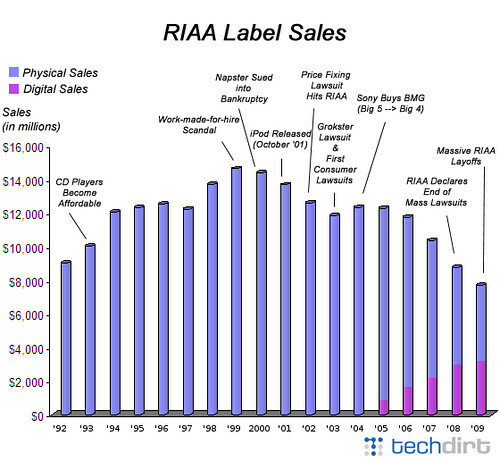 When I see that graph I think, "Gosh, album sales were elevated around 1994-2000, perhaps because CD players were adopted by the majority around that time, and then they slowly sank back to normal". I'm curious how the graph continues after 2009. I think one of the problems is that consumers probably don't know the exact reasons why they buy less albums, so that's for researchers to find out. Sound quality should be on the list, but I doubt that it's a main factor. BTW, does the loudness at live (pop) concerts follow the cd-trend? If so, it doesn't seem to have a similar influence on the attendance at popular music concerts. @bug80: Would you be able to do some similar statistics for classical productions ? I'd be very interested. Re the selection issue: I am not so concerned about genre as such (that could be counted and weighted afterwards, if necessary), but rather the “that one was totally ruined, that's gotta go into the black book” selections.